In 1966, John Lennon and Yoko Ono met for the first time at a Gallery in London. In 1971, John Lennon celebrates his 31st birthday at Yoko Ono's This Is Not Here exhibition at the Everson Art Museum in Syracuse, New York. Ringo Starr, Phil Spector, Bob Dylan, Frank Zappa and a host of Hollywood actors also stopped by to view Yoko's first major art show. In 1975, John Lennon and his wife Yoko celebrate his 35th birthday with the birth of their only child, Sean Taro Ono Lennon. In 1980, John Lennon releases "Starting Over," his first single in five years. At the end of December, it would top the Billboard Hot 100 for five weeks and the UK chart for a week. In 1985, marking what would have been John Lennon's 45th birthday, Yoko Ono formally dedicated a two and a half acre landscaped section in New York's Central Park called Strawberry Fields. The entrance to the memorial is located on Central Park West at West 72nd Street, directly across from the Dakota Apartments where Lennon had lived during the later part of his life and where he was murdered in 1980. To this day, fans still gather there to reflect and sing Lennon songs. In 2000, the John Lennon museum opened in Tokyo on what would have been his 60th birthday. In 2002, John Lennon's killer, Mark David Chapman was denied parole for a second time on October 9th, the same day that Lennon would have turned 62. The state parole board issued a statement that said releasing Chapman after 22 years in prison would "deprecate the seriousness" of the crime and while Chapman had "acceptable" behavior in prison, that didn't guarantee he wouldn't pose a threat to society. At his first parole hearing two years earlier, Chapman said he did not deserve to go free. The 48 year old prisoner lived in a housing unit separate from the general population for his own safety and worked as a clerk. 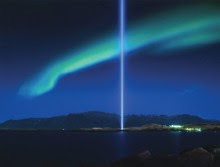 And today, Yoko Ono is in Reykjavik, Iceland marking the 71st birthday of her husband John Lennon by turning the Imagine Peace Tower back on. The Imagine Peace tower will be switched back on at 8pm on October 9 in Iceland. In other time-zones that is 9pm London, 4pm New York, 1pm Los Angeles and Monday October 10 at 7am East Coast Australia daylight savings time.